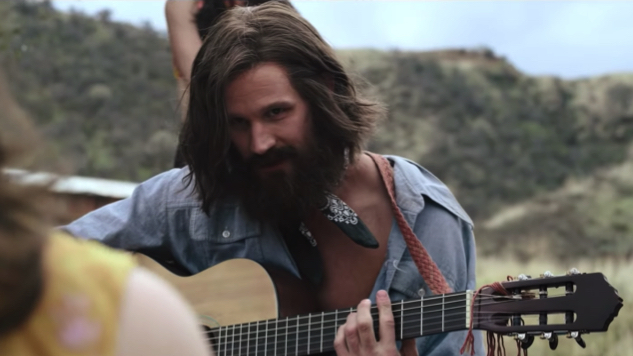 On May 10, Mary Harron’s Manson Family film Charlie Says hits theaters, giving it a good two-month leap on Quentin Tarantino’s competing movie about the cult’s murders, Once Upon a Time … in Hollywood (out July 26). While Tarantino’s film is sure to hav the director’s usual shtick splattered across it (quite literally, with plenty of blood for him to work with, as per usual), Harron’s movie sees her reunite with American Psycho collaborator Guinevere Turner to focus on the psychological. The trailer, released Thursday, shows graduate student Karlene Faith (Merritt Wever, Nurse Jackie) come to rehab three of the Manson Family members who continued to stay loyal to the cult leader (played by Matt Smith, bafflingly) years after being sentenced to life in prison: Leslie Van Houten (Hannah Murray, Gilly from Game of Thrones), Patricia Krenwinkel (Sosie Bacon from 13 Reasons Why—also Kevin Bacon and Kyra Sedgwick’s daughter) and Susan Atkins (Marianne Rendón, Mapplethorpe). Faith—who is a real person, by the way, as the script is based on her non-fiction book The Long Prison Journey of Leslie Van Houten and Ed Sanders’ The Family—sees the women as victims of Manson’s psychological manipulations and tries to help them break out of their warped view of the world. English model Suki Waterhouse appears as Manson Family member Mary Brunner and Chace Crawford (yes, that Chace Crawford, from Gossip Girl) plays the infamous Tex Watson. Watch the trailer below and read Paste’s feature on Hollywood’s fascination with Manson here.